IdeaMensch is a crowdsourced interview platform for entrepreneurs, makers, and doers. Our goal is to make it easy for people to get some publicity for their idea. My name is Mario and I am the founder of IdeaMensch. This started when I was a young employee in Advertising, frustrated by our sheer inability to actually bring ideas to life. So I started picking the brains of people who I saw succeeding in making their ideas happen. Many of them were entrepreneurs. At some point, one of them suggested I publish the notes I took. I did. From there, I quickly learned that there wasn’t an easy platform for every-day entrepreneurs to publish their stories and get some easy publicity for their idea. The insights gained from every-day main street entrepreneurs were just as, or maybe more valuable than what you’d learn from some billionaire tech entrepreneur. That’s how IdeaMensch was born, immediately gained traction and has been sustainable ever since. We have conducted over 3,000 interviews with entrepreneurs, visionaries and non profit leaders like Seth Godin, Gary Vaynerchuk, Steven Pressfield, Daniel Pink, Nancy Brinker, Craig Newmark, Brad Feld, Jake Wood and these badass female entrepreneurs. We have organized events in every single state and have been featured in Mashable, VentureBeat, Entrepreneur, Pando, Fox Business and Search Engine Land. A great way to highlight your story and expertise. I remember personally submitting my interview to IdeaMensch years ago and the value I got out of it as a growing entrepreneur. Since then, we have connected many to the community to do interviews. The team at IdeaMensch is professional and great to work with. The interviews not only show up when people search your name on Google, but are a great way to highlight your story and expertise to inspire others. Sure to shine the light on many rich stories that will stir us. I’m inspired any time someone takes a stand and starts bringing their idea to life. IdeaMensch, not only is one of those ideas, but also is sure to shine the light on many rich stories that will stir us, motivate us and ultimately inspire thousands to get started working on their own ideas. Our purpose is to inspire action through the curation of our daily interviews, content, and community. Real entrepreneurs provide all of our content through our daily interviews. Here is how to do an interview. Bringing ideas to life is good for humanity. The best ideas can come from anywhere. Win/win/win situations make the world go round. Entrepreneurial sustainability beats short-term profits. Shipping an idea is more important than perfecting it. To keep IdeaMensch feasible and sustainable, we allow people who submit interviews to expedite their publish date. Every day, we get dozens of interviews but only post a few. The rest go into the queue. So there tends to be a wait for interviews to go live. If you want to skip the line, it's $40 for entrepreneurs and $75 for people submitting on behalf of others. It's a model that has served us and our supporters for many years. We don't allow non-expedited interviews for people submitting on behalf of others, as we a) want to tilt the game in favor of entrepreneurs and b) have had some issues with "fake" interviews being submitted. We don't publish detailed traffic data, but we serve upwards of a million impressions per month. 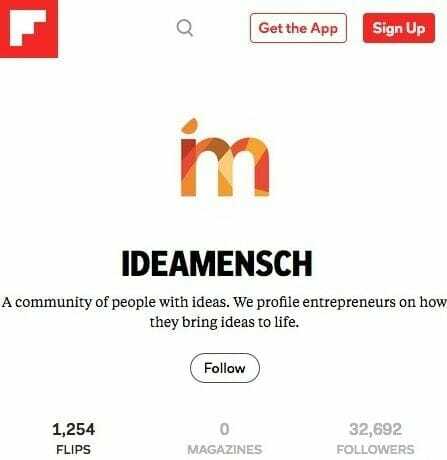 In addition, IdeaMensch is broadly syndicated across the Internet so your interviews aren't just read here. For example, 32,000+ people subscribe to our interviews on Flipboard. Most of our interviews end up ranking really well in search engines when you search for the name of the interviewee. On that note, the folks at Search Engine Land published a really nice post about to use IdeaMensch to protect your branded search results. IdeaMensch is headquartered in Missoula, Montana and run from around the world by Mario, Carlyn, and Anand.